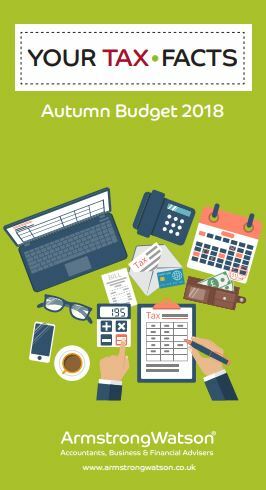 Budget Summary - Trick or Treat? The Chancellor of the Exchequer today delivered his last Budget speech before Brexit takes effect on 29th March 2019. Unusually Budget day this time was of course a Monday. Normally it takes place on a Wednesday immediately after Prime Minister’s Question Time but this week that would have been Wednesday 31st October - Hallowe’en – maybe too much of a temptation for the headline writers! The last time a Budget was on a Monday was in 1962. This Budget was delivered by Selwyn Lloyd (does anyone remember him?) in the year the Beatles played their first live dates with Ringo Starr in the line-up. Everyone remembers them! The 1962 budget, delivered on 9 April, did not result in the introduction of capital gains tax, as widely rumoured beforehand (that came in 1965). But it did reduce purchase tax on cars, TVs and washing machines and increased it on sweets, soft drinks and ice cream, leading to accusations that Lloyd was "taxing children’s pocket money." A certain journalist called William Rees-Mogg, echoing the unpopular reaction, wrote that it was "Mr Lloyd's last Budget”. Mr Hammond didn’t mention that one this afternoon! But he did announce most welcome provision for increased grant funding for social care especially for children in need. The backdrop to the current Budget included the expectation, set by the Prime Minister’s announcement at the Tory party conference that “Austerity is over”. Mr Hammond only said that it was “coming to an end”. Both comments probably rank with “Brexit means Brexit” in terms of meaningful insight. Arguably though, the signs in this direction are good, with growth in the UK economy this year likely to be in the region of 1.7% or 1.8%. Whilst we have been unfavourably compared with the leading European nations and of course the USA, growth in Europe is still underpinned by quantitative easing and in the USA by the Trump tax cuts which could yet prove an unwise move. And the rate of wage increases for some time has steadily been outstripping economic growth. The forecast continued progress in this direction does not seem sustainable without a much deeper economic recover to support it. The biggest cheer came for the announced acceleration of the increase in the personal tax free allowance to 2019 rather than 2020 but the maximum effect of this – even with the increase in the higher rate tax threshold - is to make a basic rate taxpayer £70 a year better off and a higher rate taxpayer £340 a year better off in stages between now and 2020. ‘Brexit’ as a word was mentioned only a few times by the Chancellor this afternoon but arguably it overhung everything he said and indeed didn’t say. He did announce that he has reserved an additional £0.5bn - over £4bn so far by our reckoning – to cover Brexit uncertainty and reserved for himself an opportunity to revisit in the light of an adverse Brexit outcome, with a full-blown Budget on the cards for Spring 2019. His critics might remind us that he needed a second opportunity last time to get it right – remember the “white van man” increase in NI contributions debacle? But the Chancellor’s pronouncements today were far more of the “better times ahead” tendency than “Austerity is over”, which it clearly only will be when business and consumer confidence says so. Mr Hammond has to maintain reserves to deal with the eventuality of a “no deal” Brexit. He has already indicated that a “no deal” Brexit outcome will take him back to the drawing board. He also knows he has to fund existing commitments including a £20bn increase in NHS funding. Add to this £1bn of additional funding already committed to assist local authorities to build more social housing, a £1.5bn package of rates support for smaller high street shops and nearly £1bn to fund a freeze in fuel duty. And let’s not forget that by “reducing the deficit” we are just managing to live beyond our means by a little bit less, not actually reducing the debt burden. Indeed it continues to grow. The proposal to publish a five year plan to outline Government spending plans will hopefully provide greater clarity and meaningful scrutiny of real economic progress. One hopes the forecasts will not be prepared by the OBR - whose forecasts massively overshot levels of Government borrowing in its first two years! But Mr Hammond has the benefit of a following wind right now in lower than expected borrowing figures thanks to buoyant tax receipts and slower public spending. He also has a boss who will be desperate for him to deliver some good news as relief from the Brexit battering, and a slim working majority in Parliament to manage, and who has put him in a difficult position frankly such that even a giveaway far greater than he was able to give today was always going to give ammunition to his political rivals. Not surprisingly then the giveaways were generally small. These included an average of £10,000 to each Primary school to invest in capital equipment, a new (or actually re-introduced) tax relief for expenditure on certain commercial buildings. The increase in the Annual Investment Allowance for tax relief on capital expenditure by businesses was increased to £1m for two years from £200,000 currently, a welcome move which will help many businesses in our region. Mr Hammond resisted calls to abolish Entrepreneur’s Relief, an important capital gains tax relief available to entrepreneurs who have built a business and sell it, but did increase the minimum ownership period to two years. This ought not to have an adverse effect on large numbers of entrepreneurial businesses owners. But the Chancellor did announce a number of welcome and imaginative initiatives on the infrastructure and technology fronts. As well as a £30bn road building programme already announced over the next five years, a 30% increase in infrastructure spending is to pay for a raft of new projects to put innovation at the forefront for the next generation. The tax scandal of digital giants’ UK tax bills (or lack of them) still rankles, with recent news that last year Facebook paid just £7.4m in UK corporation tax, and the introduction of a Digital Services Tax was announced to apply to profitable businesses turning over £500m globally so it is not just a turnover tax. This tax will be introduced in 2020 after a period of consultation and subject to adopting EU proposals awaited to deal with similar issues. Mr Hammond justifiably claimed that this shows determination on the part of the UK to take steps to modernise our tax system and to go it alone on that front if need be. Whilst we applaud this step, far more needs be done. The potential for the UK to continue to be tied to EU rules on taxation (and many other issues) has been buried in the pre-Budget news but has been highlighted by Armstrong Watson. Following the failure of some of its tax initiatives, the EU Commission is pressing ahead with plans to remove the veto member states currently have. This could leave the UK subject to a raft of EU rules as the price for signing a transition deal. This would severely limit the opportunity the UK has to set out its stall for the future as a dynamic, modern economy with a progressive and incentives-based tax system. We simply cannot afford to make this mistake.